On a stormy Sunday in January 2009 I mentioned to my sister-in-law Susie that it was a real Oregon day. It was raining. It was blowing. It was gray. It was a challenge. I added that it was probably a day just like that when members of my family arrived in Oregon in 1843. She asked me if they came in a covered wagon. No, I told her, they came to Oregon City from New York City on a boat. Portland didn’t yet exist. My great, great, great grandmother, Mary Charlotte Pettygrove left New York on the boat Victoria on March 10, 1842 bound for Honolulu. She was with her husband Philip Foster and her brother Francis Pettygrove. Foster and Pettygrove had owned a general store in Calais, Maine. They brought goods to stock a store in Oregon City. On October 19, 1842 the Victoria arrived in Hawaii. More goods were bought to sell in Oregon. In April, 1843 the bark Fama took them as far as what is now St. Helens. Small boats were then hired to take the families and goods to Oregon City. On May 23, 1843 Foster and Pettygrove opened for business in Oregon City. Francis Pettygrove founded the city of Portland, along with Asa Lovejoy, in 1845. That year he built a log building for a store at Front and Washington Streets. It was the first business building in the town. In 1848 he sold his Portland holdings, for $5,000 in tanned leather, to Daniel Lownsdale. He then left for the gold fields in California to sell goods to the miners. He returned to Oregon City in 1850. In 1851, his decision possibly based on his fifty-fold profit from the Portland city founding, he moved his family north and founded the city of Port Townsend, Washington. He died there in 1887. Philip and Mary Foster made a donation claim for a farm at Eagle Creek. In 1845 Foster built a grist mill on the creek above his cabin. That fall my great, great grandfather Frank was playing with his older brother George above the mill. They heard cries for help. They saw two men, supporting each other, trying to reach them. They ran away to get their dad. The two men were Samuel Barlow and William Rector. They were weak from lack of food and from an arduous trek. They had made it overland from the Dalles to Oregon City. They were the first non-natives to find the way. Samuel Barlow had arrived at the Dalles with a wagon train in September of 1845. At the Dalles they found it difficult to hire a boat or raft to take them by river to Oregon City. It was also very expensive to stay where they were. Joining with a wagon train led by William Rector they decided on the drastic course of traveling overland by going around Mt. Hood. Their train consisted of 13 covered wagons. A train of 23 wagons, led by Joel Palmer, joined them at their camp in the Tygh Valley. They made it as far as what is now Barlow Creek, five miles South of Mt. Hood, before the first snowfall. Just getting that far had been exhausting, passing over hills where the wagons had to be lowered down with ropes. Barlow and Palmer scouted ahead looking for the best route. Returning to Barlow Creek it was decided to build a cabin. The wagons would stay there while Barlow and Rector pushed ahead on foot to bring back help from Oregon City. Their efforts brought them to the Foster farm. As soon as Barlow was established in Oregon City he asked the provisional government for a license to build a toll road from The Dalles to Oregon City. Tolls were set by the government at five dollars per wagon and ten cents for loose animals. He went into a partnership with Philip Foster to build the road. Work started in the spring. It worked east from the Foster place. It was slow going with miles of brush, forest, creeks to cross and recross, mountainsides, and swamps to be “corduroyed.” At the completion it was a still an arduous trek of eighty miles. In July of 1846 the wagons left behind at Barlow Creek were brought out. In October a wagon train of 146 wagons, 1,500 head of cattle, horses and mules, 13 sheep arrived at the Foster Farm. Shortly after that, before snow closed the road for the winter, seven more wagons arrived. It made the total 153 wagons and 700 adults. In the Spring and summer of 1847 more work was done on the road. By the fall of 1848, when most wagon trains would arrive, the road was considered “passable” for its entire length. A toll gate was installed near Zig Zag. Foster built a small store near the eastern gate to supply the immigrants at the start of the road. As a money maker the toll road was a bust. Each year much of it needed to be rebuilt after the ravages of winter. As a conduit for settlers into the Willamette valley it was a huge success. From 1846 through 1849 1,150 wagons and 5,777 people traveled the Barlow Road to the Foster Farm. My great grandmother, who was born Ethel Foster, died in 1966 when I was thirteen. She was born in the Damascus area on Jan 5, 1889. Her father, Frank Foster, died when she was six months old. He is buried in the Damascus Pioneer Cemetary. When I was little gtrandma Ethel had a house just off Powell on 33rd Place. Mayor Terry Schrunk was related to the people next door. In the summer I would see him in the back yard wearing Bermuda shorts while drinking cocktails and barbecuing. She was very proud of her family’s place in Oregon history. Philip Foster also built a road from Eagle Creek to Portland. 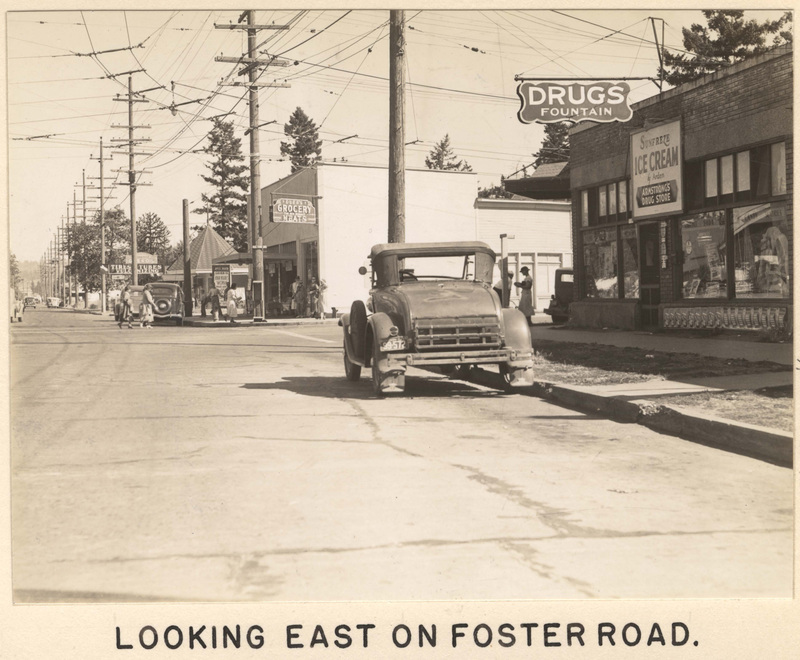 It was first known as “Foster’s Road.” It formally became Foster Road later. In my great grandmother’s house, in a china cabinet, with shelves behind glass doors, was a yellowed clipping from the Oregonian. It was a picture of her, my grandmother Doris, and my aunt Colleen at the formal dedication of Foster Road sometime in the late 1930’s. All of that is from my mom’s side of the family. There are Oregon pioneers on my Father’s side too. They came on the train. My father’s parents were both born in Finland. My grandfather Jacob Nyback went through Ellis Island in 1910. My grandmother Fiina Isojarvi had arrived earlier. They met and married in Minnesota. In 1913 they read a circular that said verdant homesteads were still available in Oregon. The homesteads were near Fort Rock. They accepted that as true and headed west. The part about homesteads was true. The part about verdant was not. When they arrived it was near the beginning of a drought that would last many years. Many others also homesteaded there during that time. As a married couple they claimed a half section. My father was born in the town of Arrow in 1917. Look for it on an Oregon map. You might find it if the map is old enough. It doesn’t exist anymore. His older brother Reino was born there in 1914. Their father Jacob, my grandfather, was killed in a logging accident near Bend in 1918. My grandmother Fiina stayed on the land, in a one room cabin, with her two children, until 1920. Then the five years to prove up the land were over. They left the homestead that year along with the Alanko family, in a Model T open car, and relocated to La Center Washington. The taxes on the homestead were always paid and the property stayed in my family until 2007. My father and Tauno Alanko grew up together. During World war II they were both in the Merchant Marine. They sailed out on the first Liberty Ship produced in the Kaiser shipyard, the SS Star of Oregon. After a trip of several thousand miles it was sunk by a U-Boat off of Trinidad on August 30, 1942. Only one sailor was killed. Tauno now lives in Vancouver, Washington. 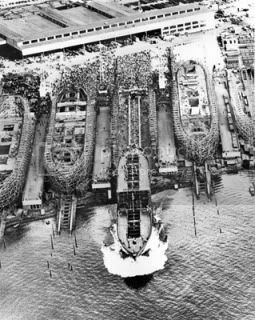 COURTESY OF OREGON HISTORICAL SOCIETY • The Star of Oregon, the first World War II Liberty Ship built in Oregon, is launched from the Oregon Shipyards. It was launched on Sept. 19, 1941, and sunk by a torpedo a little more than one year later. When members of my dad’s side of the family would talk about the homestead they always called it Fort Rock. On current maps the area is called Christmas Valley. If you drive down there you’ll be struck by just how inhospitable the landscape is. Irrigation has brought patches of green. Where the irrigation stops it is barren and dry. It seems impossible that a widow with two infants could have lived there for a day, much less a couple of years. The one room cabin lasted until the early seventies. After that it had a year or two as a pile of boards. Eventually the boards were taken by scavengers and the home site vanished all together. My mom was born a Galloway. Family history was often a topic of discussion at family gatherings. At one of them my grandfather Dale Sherman Galloway (married to Ethel’s daughter Doris) had enough of hearing about the Fosters. He said “The Galloways have been in the Northwest as long as the Fosters have. And were in the United States even earlier. ” That was not exactly true, but he was right in that he came from Oregon pioneer stock. His father James Sherman Galloway, only one year old, arrived in Yamhill by wagon train in 1865. I recently found a genealogy of the descendants of John Jackson Galloway. He was born in Kentucky in 1792. I’m there. My sister Debbie is there. My mother Joanne Galloway is there. My grandfather Dale Sherman Galloway is there. He was born in Touchet (in the state of Washington between Umatilla and Walla Walla) in 1908. His father James Sherman Galloway was born in Indiana in 1864. His father arrived in Oregon in 1865 in a wagon train that contained three generations of Galloways. They first settled in Yamhill. His younger brother Sheridan was born there in 1866. You can visit the Foster Farm today. It is a National Historic Site. On a hill overlooking the farm is a small pioneer cemetery. Philip and Mary are buried there. I have other relatives buried in various spots in Oregon and Washington. Maybe this year I’ll visit some of them. I hope we’ll have another family reunion at the Philip Foster Farm. My grandfather was Elvin Galloway, Dale’s brother. Dale was right and more so. His father, Sherman married Mary Miama Shadden. The Shaddens came west in 1842 on the first emigrant train that brought families to Oregon. Finally, Mary Miama’s mother was Amanda Dawson (married henry Clay Shadden). The Dawsons came west on a train in 1845 – the infamous train that took the Meek’s cutoff through central Oregon that resulted in many perishing. So my great uncle Dale was right – the galloways have a rich heritage in the northwest. I have more information in the form of a story about the Galloways if you are interested. I knew Uncle Dale and Doris well. Bob, I really appreciate this information. My mom used to talk about the Dawson side of the family. I should have written that down at the time or more properly remembered it. I would like to hear more family stories. Where do you live? May name i Sten-Ole Nyback and my cousine is Ragnhild Harrington, are you a relative to her? I am living in Kronoby, Finland. Thanks for writing. I would guess all of the Nyback’s in the United States are related. My dad told me the original name was Nybacka. My grandfather Jacob Nyback immigrated to America around 1910. He married Fiina Isojarvi in America, who also came to America around 1910. Jacob had a brother named Matti who came to America with him. I believe Matti stayed in Minnesota when Jacob and Fiina moved to Oregon. Re: Yes, I am Sten-Ole’s cousin and live in the Seattle, WA area … Shoreline. Would you please contact me in order for me to give you more information so I may contact him or visa versa. We last saw one another at a Family Reunion in Nykarleby in 1990. Old phone #’s from my Mother’s Address Book are useless. The last time I spoke with you was back in 1988 when I was trying to locate other relatives. Thank you so much. Thank you for sharing Dennis! It was a pleasure meeting you last year at the family reunion. Hope to see you again this year! I am only just starting to research the Jacques history. (I married a Jacques)I was told the Jacques came to Oregon by way of covered wagon. That they possibly came to Oregon with the Fosters.(?) Our g grandfather Chester and three sons and wife are buried in the Philip Foster cemetery. Chester, Eliza Bradley Jacques Wilburn (she remarried when Chester died) sons Clark, Herman, and Walter. I was told the Jacques and Fosters intermarried. Not sure who or how. Also Eliza Bradley’s sister married a Foster. I have no further information on who Chester’s parents were. He was born 1831. Where unknown. If you have any information or direction for me to go to search, I would really appreciate it. Thank you! !